SKLTSHU M.Sc Horticulture Entrance test 2018-TS Horticultural University: SKLTS Horticultural University will publish the M.Sc Horticulture Courses Admission 2018 notification and applications will be invited for admission into M.Sc(Hort.) with specialization in Fruit Science (6), Vegetable Science ( 12), Floriculture & Land scape Architecture(9) , Plantation, Spices, Medicinal and Aromatic Crops (3)Seats with a total of 30 seats. Application form, Selection procedure, last date for apply, hall tickets, exam date, results, counselling dates and certificates verification dates are available at SKLTSHU web portal. About: SKLTSHU - Sri Konda Laxman Telangana State Horticultural University was established during 2014 with mandate for Education, Research and Extension in Horticulture and allied fields in the State of Telangana. After bifurcation of the A.P State, the total number of seats approved for combined University Dr. YSRHU were divided in the ratio of 64 % ( 42% to A.U, 22 % for SUV) and 36 % for Telangana State respectively duly following the provisions under the article 371D. The University imparts instructions leading to the Master’s degree courses and Ph.D. courses in Horticulture at its constituent Colleges at Rajendranagar, Hyderabad and Mojerla, Mahabubnagar District in Telangana State. M.Sc. ( Hort.) with specialization in Fruit Science (6), Vegetable Science ( 12), Floriculture & Land scape Architecture(9) , Plantation, Spices, Medicinal and Aromatic Crops (3)Seats with a total of 30 seats . a) Reservations for Local & Non Local candidates: Reservation of Seats for different local and non-local areas shall be as per rules. c) 3 % seats in the course are reserved for Physically challenged candidates as per the Government norms. d) 3.5 % seats in the course are reserved for NCC/NSS/Sports/Games and Ex-Servicemen as per the Government norms. M.Sc. ( Horticulture): The selection shall be based on the previous academic record (B.Sc. – 40% and performance in Entrance test -60%). General and OBC Candidates with 50 % Marks in the entrance relaxable in case of S.C/S.T candidates with 25 % Marks in the entrance test are eligible for interview /counseling . 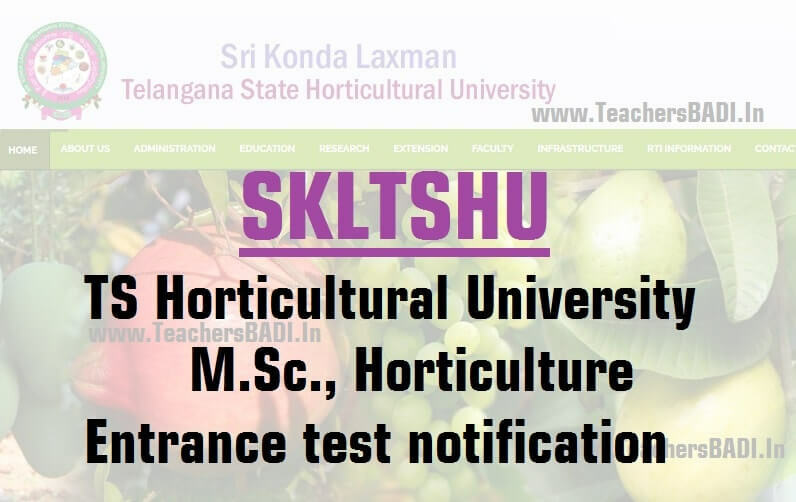 The Entrance Test shall be comprehensive one, covering all relevant subjects prescribed for the concerned Bachelor degree requirements of SKLTS Horticultural University. The candidates should appear for the entrance test at their own expenses. The entrance test is of 2 hrs. duration with multiple choice questions for 200 Marks and answers must be written in English . Applications for all courses duly filled in with Demand Draft and all the prescribed certificates should be sent to “The Registrar, Sri Konda Laxman Telangana State Horticultural University, Rajendranagar, Hyderabad-500 030 on or before -............-2018 by 4.00 PM. Postal delays will not be condoned. PG Entrance Exam Date: Entrance examination for admission into PG & Ph.D courses of SKLTSHU, for the academic year 2018-18 scheduled on 12-07-2018, is POSTPONED..
Last date for submission of applications is ...................with a late fee of Rs.2000/- for General and Rs.1000/- for SC, ST and PH categories (M.Sc. Courses) for each course. All the eligible candidates in P.G Entrance Test should bring their original certificates at the time of counseling.